Peter Pace, a Marine lieutenant whose platoon engaged in fierce fighting near Hue in 1968, devoted his career to the military because of something that did not happen to him in Vietnam. While men all around him were dying or being wounded, Pace did not suffer a single injury. He felt he owed it to his fallen comrades to continue serving his country, a commitment that sustained him for more than 40 years of active duty and led to an appointment as chairman of the Joint Chiefs of Staff in 2005. Pace’s assignments on his way to the top included deputy commander, Marine Forces Somalia, December 1992 to February 1993, and deputy commander, Joint Task Force Somalia, October 1993-March 1994, providing humanitarian and security assistance to a country torn apart by battling warlords. He later became deputy commander, U.S. Forces Japan; commander, U.S. Marine Corps Forces Atlantic/Europe/South; and commander in chief, U.S. Southern Command (Central and South America). 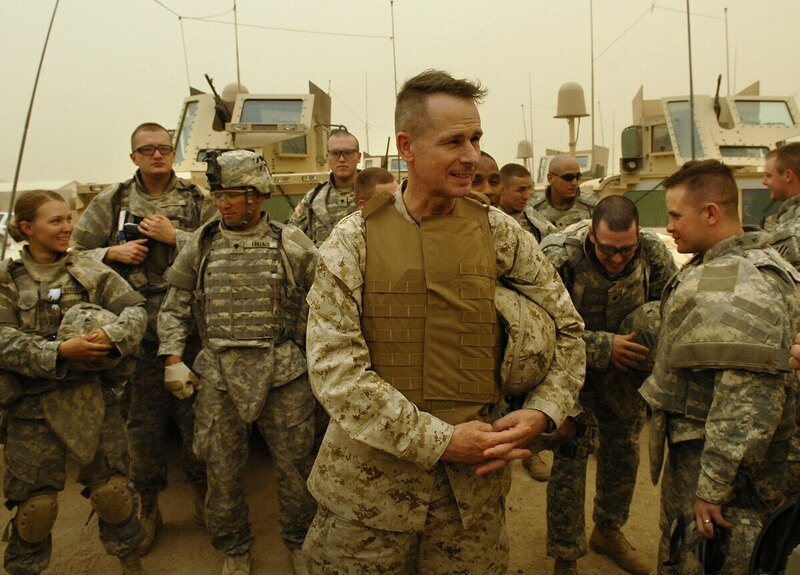 He was vice chairman of the Joint Chiefs, from October 2001 to September 2005 and then chairman until October 2007, the first Marine to hold either position. During that period, the country was enmeshed in wars that had begun in Afghanistan in 2001 and Iraq in 2003. In 2008, President George W. Bush presented the retired four-star with the Presidential Medal of Freedom, the highest civilian honor the president can bestow. In an interview with editor Chuck Springston, Pace reflected on his time in Vietnam and its impact on his views as a military leader. During the North Vietnamese Army’s 1968 Tet Offensive, you were with Marine units in one of the bloodiest battles of the war, the fight to retake the city of Hue. What do remember from those days in February 1968? I got to Phu Bai [a base just south of Hue] and was told I would be joining the 2nd Battalion, 5th Marines, up in Hue City. Then-Maj. and later Maj. Gen. Orlo Steele had just reported aboard as the battalion XO [executive officer]. He and I, a driver, and one guy with a rifle hopped in a jeep and drove from Phu Bai to Hue City— one vehicle, by ourselves. We had no idea at the time how many NVA were in the area. When I got there, I remember meeting then-Lt. Col., later Lt. Gen., Ernie Cheatham, the battalion commander. When he stood up to shake my hand, I remember thinking he’s a big man. Of course, he had been a professional football player [defensive tackle for the Pittsburgh Steelers and Baltimore Colts in 1954], so I guess his size shouldn’t have surprised me. Then I went down to my platoon. The platoon was at the railroad bridge crossing the Perfume River, and our responsibility was to protect that bridge. I remember seeing Sgt. Reid B. Zachary, now a retired sergeant major. Zachary was on his second tour. He was my platoon sergeant. I was my platoon’s third platoon commander in as many weeks, so I knew they had been in some significant combat already. The platoon itself, including detachments, instead of being 40-plus was down to about 22 Marines—14 riflemen and about eight machine gun and mortar crews. And I remember the impression that, wow, these folks have been through some significant combat, and it was clear that there was more to come. What kind of missions did your platoon undertake? Once we got done with Hue City, at the end of February the beginning of March, we started to patrol areas in the country. Basically, you had several grid squares to patrol. We’d patrol those grid squares and keep our presence known. We’d try to be supportive of the local villagers. We had a presence mission. There were patrols every day and every night to make sure we had control of our sector. What impact did the war have on you as you went through your life and career? It changed my life completely. I went to Vietnam anxious to serve my country, and I did. I was in a unit, Golf Company, that of the original 158 who went into Hue City, 155 were killed or wounded. I was in the field for 13 months. I had Marines in front of me, Marines left of me, Marines behind me get killed or wounded. I got through 13 months without a scratch. I know at least three times when I should have at least been wounded, if not killed. So when I came back from Vietnam I said my prayers and wondered, how is it that I could have been in a place like Hue City and all the other places and not get a scratch? At the same time, wonderful men, like Lance Cpl. Guido Farinaro, Cpl. Chubby Hale, Pfc. Whitey Travers, Lance Cpl. Mike Witt, Staff Sgt. Freddy Williams, Cpl. Little Joe Arnold and Lance Cpl. Dan Miller, gave their lives following 2nd Lt. Pace’s orders in combat. When I came back I felt like I owed those men more than I could ever repay, and I determined that I would stay on active duty to try to live my life in a way that would pay respect to the way they gave theirs. So truly my 40-plus years in uniform were all about trying to live out what I believe God had laid out in front of me in 1968 and 1969 and to do it in a way that paid respect to my guys. Looking back 50 years later, what are the lessons of the Vietnam War? I was a lieutenant, so everything I thought about the senior leadership was based on how the battlefield laid out in front of me. I believed, at the time, that our senior leaders were not being forceful enough in describing to the president and the civilian leadership what needed to be done to prevail. I took that to heart when I was vice chairman and chairman, and I made sure that I spoke truth to power the best I knew the truth to be, when I had the responsibility. I believed, and most of the guys who were there believed that we were winning on the battlefield, but that made no difference when the political decisions were made. The South fell to the North not because of our lack of military capacity but because of our unwillingness to use it. The lesson is: If you’re going to go in and do something, understand that you’ve got to continue to fight until you prevail. We’re relearning that lesson in Afghanistan and Iraq right now. You see parallels between Vietnam and the Afghanistan, Iraq, ISIS conflicts? The biggest parallel is if you leave the battlefield too soon, something you do not want is going to come in. We left Vietnam too soon, and the North comes south. We left Iraq too soon, and ISIS filled the void. What should Americans remember about the Vietnam War? Well, No. 1, there’s an awful lot of names on the Vietnam Wall who did not want to die for their country but were willing to die for their country and served it in a way that helped preserve freedom for us. Remember those who sacrificed themselves for us. Second, if you’re going to ask your most precious assets, your young men and women to potentially die for your country, you owe it to them to finish the job. We should learn the lesson that if you’re going to commit the nation to war, then see it through. Are there any political or military leaders throughout history that you admire? I admire President Lincoln for not only what he did for the nation, but how he did it. There’s a great book called Lincoln on Leadership [by Donald T. Phillips]. It shows how President Lincoln operated and breaks it down into digestible leadership traits. I have great respect for Gen. [George] Marshall [who served Presidents Franklin D. Roosevelt and Harry Truman]. He is a great example of a military leader. I’m often asked, who are my role models? My role models were my bosses along the way. I was incredibly fortunate to have leader after leader, commander after commander, while rising up the ranks, who I could admire and emulate. Our armed forces, then and now, are fortunate to have, for the most part, leaders who care about their troops and sincerely want to be good leaders.